Nonfiction Audiobook Narration Audition: Kill Diet! I submitted this audition to Scott Hogan, author of KILL DIET Part 1: How to Eat More, Lose Fat, Save Time, and Enjoy Your Food (KILL DIET Series) via Amazon's ACX. Trustees, Volunteers deserve honor & gratitude, not grief! This makes me sad in so many ways. I'm not an attorney like Councilor Sullivan, but as Library Director in Brockton, and four other Massachusetts municipalities, I was an employee. I worked for the city or town every day. That seems nearly opposite a per diem "contractor" such as an attorney. More disappointing is to treat in such a manner someone who has given to the City of Brockton in myriad ways for all his life. Most puzzling is to treat someone this way when you have three Library Trustee vacancies to fill. Will other potential appointees to this UNPAID position decide it's not worth the grief and pain? A library needs public-spirited Trustees to work with the Library Administration. Attorney Larry Siskind, Mayor Bill Carpenter's choice for the volunteer post, was appointed as outside council for grievance hearings briefly last year before he resigned, citing a conflict with one of his son's legal clients. He said he objects to being “belittled” in public when it isn't warranted. 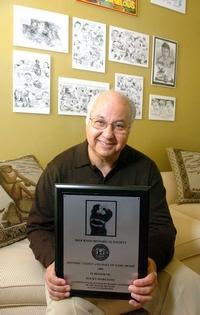 Picture caption: Brockton attorney Larry Siskind, the former president of the Brockton Historical Society, is shown in 2009 when Rocky Marciano was postumously awarded the Historic Citizen Award. 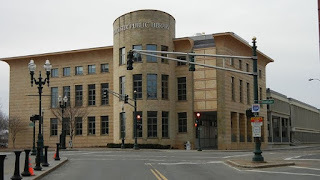 BROCKTON – The City Council has held up the appointment of Larry Siskind to the Brockton Public Library’s Board of Trustees, questioning work he performed for the city earlier this year as an outside counsel for grievance hearings. Siskind, a 50-year labor law attorney, is Mayor Bill Carpenter’s choice for the post. Several City Councilors, acting as the Finance Committee on Monday, said they want to know how many hours Siskind worked, on which cases, and for how much money before they will vote on his appointment. At-Large Councilor Robert Sullivan raised questions as soon as Siskind said he would be honored to serve. Siskind said his tenure was brief because he soon learned his son was representing a client with a claim against Brockton. He and his son Neal are partners in Siskind & Siskind, a personal injury firm on Belmont Street. “I had to resign, which was the right thing, and the honorable thing to do,” he said. Known for philanthropy and voluntarism, Siskind is a founder of the Brockton Boys & Girls Club, was a 10-year president of the Brockton Historical Society, and a board member of HarborOne Bank. “I have never had any of my work, either private or for the City of Brockton, challenged like this,” he said. Siskind told The Enterprise that he submitted one $3,500 bill to the city on May 6 for 20 hours of work. “And I discounted that bill, because those weren’t the only hours I worked,” he said. Siskind charged Brockton $175 an hour for services he said are usually billed at between $300 and $350 hourly. “He was a paid employee of the City of Brockton – a public employee, not a private employee,” he said. Carpenter said Siskind is an “institution” and the council should be thankful for his willingness to serve, rather than challenging him. There are currently three openings on the library board. Reach Michele Morgan Bolton at mbolton@enterprisenews.com. Public Libraries: More stress than safety in this workplace. Every few years "scholars" release a survey ranking on-the-job stress for different professions, often claiming that working in a library is blissfully stress-free. Public Library workers, especially in the US, groan at this misrepresentation. Here's just one reason why. Man accused of stashing gun on shelf at public library: Worcester man faces gun charges after incident. WORCESTER, Mass. — A Worcester man faces gun charges after police say he stashed a handgun inside a public library on Friday. An off-duty Boston police officer said he followed a man into the Worcester Public Library about 11:15 a.m. after seeing a handgun in his waistband. The officer contacted Worcester police. When police officers located the man inside the library, he was sitting at a computer without the gun. Officers reviewed library surveillance footage and saw the man, later identified as Luis Bermudez, 24, putting the gun on a shelf in one of the library aisles. Bermudez, who does not have a license to carry a handgun, was arrested. Bermudez was charged with disorderly conduct and possession of a firearm/ammunition without an FID card. The gun was recovered by officers. Stephen King at the top of his form! This review is probably superfluous – I assume this will be widely reviewed (or at least rated.) However, I want to share my opinion that this is Stephen King at the top of his form – if you prefer his character-oriented, not-so-supernatural writing. Like any great master, he makes the work seem effortless. Getting swept along by his seemingly simple prose feels similarly effortless to this reader. I don’t turn the pages to see what will happen next to his characters because they are glamorous; I do so because they have become real to me. Among the special gifts in this one are some musings, seamlessly worked into the story, about the phenomenon of being so immersed in fiction that its world can seem more “real” than that of the reader. I enjoyed this thoroughly at multiple levels. Thank you, Stephen King!